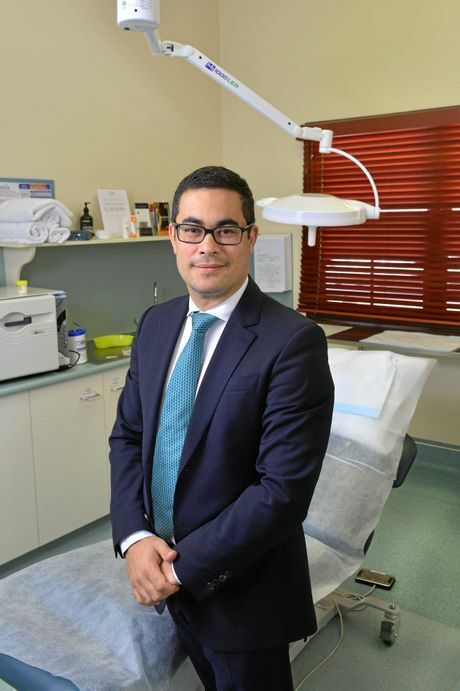 Dr Sharp was featured on the front page of Saturday’s Queensland Times in a special feature about the new plastic surgery procedures and services he performs in the region that spans between Brisbane and Toowoomba. In the feature Dr Sharp discussed the skin cancer surgeries he performs often due to high UV exposure levels - as well as the cosmetic procedures, such as breast augmentation, breast reduction, abdominoplasty (tummy tucks) and facelift surgery. He also explains the advanced training that plastic surgeons undergo to specialise in their field. 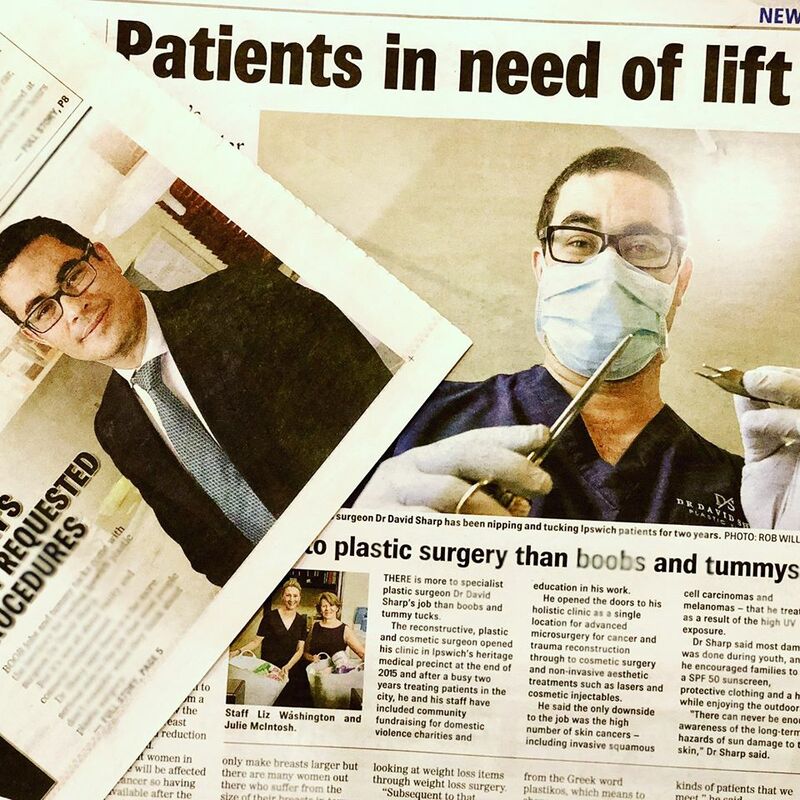 LIFE in plastic might be fantastic for Barbie, but for Ipswich’s leading plastic surgeon, there is a much more human focus at the heart of breast augmentations and tummy tucks. Plastic surgeon Dr David Sharp has been changing the lives of Ipswich patients for two years - his work fundamental in helping cancer patients recover from treatment, those who have lost excessive weight take the final step in their health journey and trauma victims return to normality. He said plastic surgery included everything from breast enlargements and reductions, tummy tucks and face lifts to re-construction following cancer treatment and skin cancer treatment. Dr Sharp discusses the fact that while breast augmentation is one of his most popular procedures, there is a perception that plastic surgery is only about making breasts larger - whereas in reality, many women who suffer from the size of their breasts are actually reducing their size, in record numbers. One in eight women in their lifetime will be affected by breast cancer, and Dr Sharp also spoke to the newspaper about the flap reconstructions that local patients once had to travel elsewhere to undergo - which are now available closer to home. The article features one of our amazing patients, Jenny, who underwent breast reconstruction with Dr Sharp last year, after a 20 year journey. Ms Dixon was diagnosed with breast cancer in 1991 and had a mastectomy on one of her breasts and only opting for re-constructive surgery with Ipswich plastic surgeon Dr David Sharp last year. She said there were limited choices for breast cancer patients before Dr Sharp opened his practice and, not wanting to have silicone in her body, waited more than 20 years to have her breast re-constructed. Ms Dixon said she opted for a new breast reconstruction technique that took tissue from her abdomen and used it to mold a new breast. Dr Sharp explained that the plastic surgery industry did not gain its name from creating a Barbie-like effect in patients, but instead derived its origins from the Greek word ‘plastikos’ which means to shape or mould.